One thing we have learnt from our past investment experiences, is that it is always better to strike while the iron is hot. For resource investors, this adage is starting to make sense now that metals prices have begun their long-awaited comeback. It’s not just precious metals such as silver and gold that are garnering investor attention. Base metals like zinc and lead are also ticking higher on the back of demand-supply imbalances finally starting to clear. If indeed we are seeing a turnaround in the trends that are underpinning commodities markets, it may well be a great time to look for projects with high-grade mineralisation that have either been undervalued or overlooked. Here at The Next Small Cap , this is exactly our modus operandi for the benefit of our loyal readers — looking for potential bargains at the smaller-capped end of the ASX market. One company that has wholeheartedly grabbed our attention has recently acquired highly prospective ground in Peru and has been quick to conduct early sampling to confirm the presence of ‘bonanza-grade’ zinc (Zn), silver (Ag), lead (Pb) and gold (Ag). That’s right a micro-capped $7M-valued ASX explorer has landed a project with some of the world’s hottest metals. The company has just raised $2.9MN, and counts on 13.65% of its shares being held by influential resource fund Resource Capital Funds . This company is currently in the early stages of exploration with assay results pouring in that have increased the number of known mineralised bodies from 7 to 30 (in the space of 4 months), with even more discoveries anticipated. But it’s not just zinc. The company’s early sampling programs have also produced peak grades of 920 g/t silver, 24.15% lead and 3.59 g/t gold. Remember, however that this is an early stage exploration play and while the early grades are high, there is no guarantee they will remain at these levels as the company continues to explore. If considering this stock for your portfolio, take a cautious approach and seek advice from a professional financial advisor. The company has now launched head-first into its next mapping and sampling program, and is gearing up as quickly as it can for its first drilling campaign. One of the biggest advantages with this ASX explorer, is that backing it at such an early stage provides an investment opportunity into a spectrum of metals, rather than putting all the eggs in one basket and focusing on one. With the commodities bandwagon finally turning around in terms of sentiment and valuations, now could be a good time to re-evaluate the possibilities in metals. Backing a cashed-up micro-cap, multifaceted zinc-silver-lead (and let’s not forget gold) explorer, operating in a low-cost area with superlative metals grades already confirmed, could be a masterstroke when considering the possible trajectory for this company relative to its peers. If its positive sampling results stay the course, this explorer could be taking its first steps towards building a metals empire in South America. ...and ICG has managed to grab a hold of a once dormant project and discovered three distinct prospects that indicate high-grade zinc, silver, lead and gold mineralisation. This means ICG can conduct exploration with more confidence that an economically viable deposit is in the offing and a maiden JORC-defined resource is on the near horizon. ICG’s flagship project is the Riqueza Zinc-Silver-Lead Project in Peru, South America. Here it is mapped out showing three prospects which are the current focus — Humaspunco, Uchpanga and Pinta. 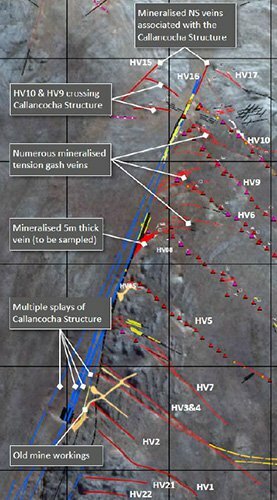 Those red lines are bodies of mineralisation (veins, mantos and breccias) sampled and assayed by ICG in only two sampling programs reported to date. We’re expecting a lot more red ink will be used the next time this map is reported by ICG. Riqueza represents a superb mixture of early-stage untapped potential with numerous high grade Zn-Ag-Pb occurrences already recorded. Riqueza has never been drilled — previous owners seem to have been satisfied with exploration and artisanal mining of surface and near surface mineralisation. With so much surface and near-surface mineralisation there was no apparent need to drill and therein lies the opportunity for ICG. So, in a nutshell, Riqueza has outstanding grades, dozens of old mine workings and a dramatic increase in the number of mineralised bodies. And it has never been drilled! This could be one of those rare moments in the junior exploration market time and space. However, at the same time, it is early days here, and continued exploration may not be as successful as anticipated – so like all early stage exploration plays, apply caution if considering an investment. Now consider this in the context of a global recovery involving three of the hottest metals. Riqueza currently has three prospects that are each exceptional in their own right: Humaspunco, Uchpanga and, the most recently discovered prospect, Pinta. A mouth full? The idea is to progress exploration at all three prospects in order to evaluate and prepare each area for possible drill testing. We imagine that the best prospect, and at this stage it is hard to separate the three, will receive the most drilling. For the time being, it is hard to look beyond the Humaspunco prospect where the most work has been conducted and has produced 24 of the 30 known mineralised bodies. This suits the company nicely as zinc (in particular) and both silver and lead are high on the agenda. 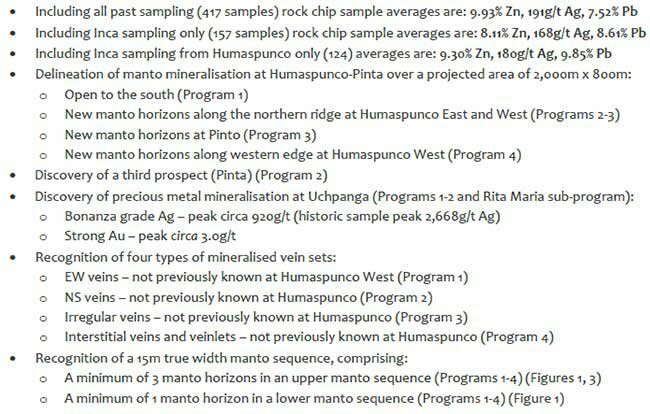 Humaspunco currently hosts 26 mineralised bodies (comprised of veins, mantos and breccias) concentrated in an area roughly 1.2km x 800m. They occur in very close proximity to each other, are either parallel and/or intersecting and all bodies show consistently high grades of zinc, silver and lead. ICG’s samples are routinely showing grades higher than 20+% Zn, 300+g/t Ag and 17+% Pb — now that is what we like to call bonanza-grade mineralization here at The Next Small Cap . ...and the fact these grades are being generated from surface sampling (and let’s be clear, that’s the sampling of outcropping rocks that you can walk on) means the potential below the ground is at the top of the range of expectations. From a potential mining standpoint, the mineralisation at Humaspunco is highly conducive for future commercial development because the mineralisation is closely paralleled and “criss-crosses” so frequently. Take a look at the schematic cross section below. The estimated total combined strike length of the known (to date) veins (HV1 through to HV20) is at least 3000m with known vein lengths ranging from 30m to 300m. The veins are parallel, closely spaced and intersect a mineralised manto at least 15m thick with 4 known (currently) manto horizons. Mineralised breccias typically occur at these intersections. ...but if you’re scouring for high-grade zinc-silver-lead mineralisation, anomalies are considered the “keys to the vault” by geologists. Even more noteworthy is that this anomaly is not a geophysics anomaly – it is a geochemical anomaly meaning it is based on laboratory assay results. 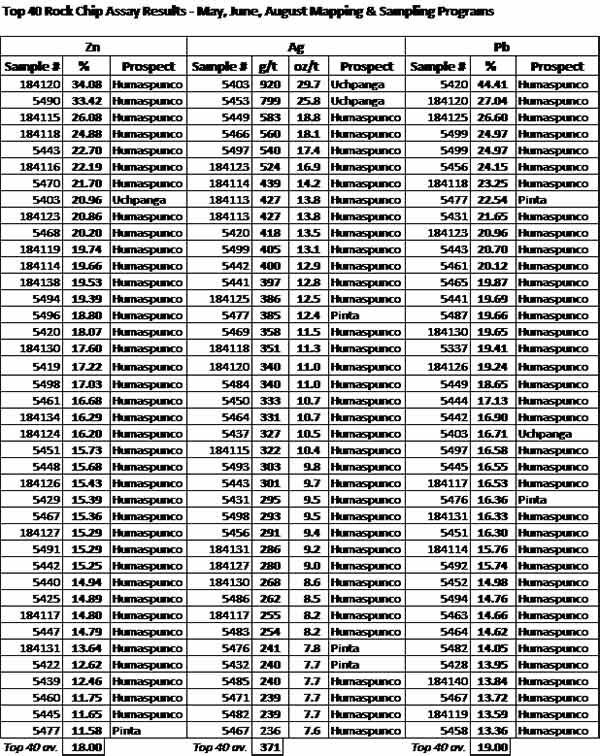 This anomaly and the 26 known (to date) mineralised veins, mantos and breccias are included in the rapidly growing inventory of drill targets at Humaspunco. 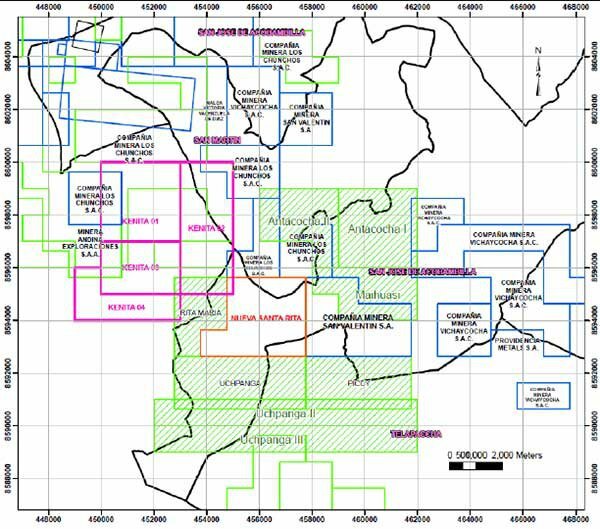 In the meantime, ICG is busily mapping and sampling the remaining 75% of the Humaspunco prospect in readiness for when the Riqueza drill permit is granted. 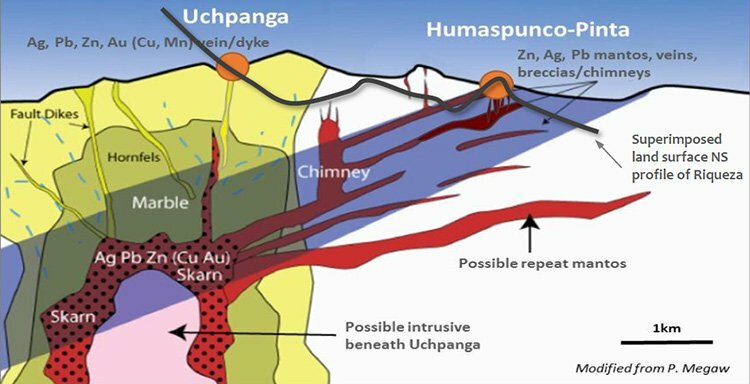 Approximately 2km SW of Humaspunco is ICG’s second prospect – Uchpanga. Uchpanga offers ICG something a little bit different when it comes to metals. Material collected and sampled from Uchpanga to date contains bonanza grades of silver as well as very strong grades of zinc, lead, gold and manganese with copper thrown in for good measure (peak grades from all ICG samples to date at Uchpanga include 20.96% Zn; 920 g/t Ag; 16.71% Pb; and 3.59 g/t Au). What this table shows is that the style of mineralisation at Uchpanga is different, a little hotter (epithermal temperatures), effecting different host rocks. Consequently, the metals, gangue minerals and alteration styles are different. ICG geologists know that on a regional scale they are related. Just 15kms away, a replacement-style zinc-silver-lead mine has proven epithermal gold and copper credentials. While only 10% of Uchpanga has been mapped and sampled to date, ICG has already reported discovery of a 750m long gossan (surface weathered metals) and at this stage, it seems likely to be included in the company’s drill targets (given assays of +25% combined Zn-Pb, bonanza grade silver (29.44 oz/t) and gold > 2 g/t). Irrespective, Uchpanga offers ICG not just a base metal mix but a precious metals mix as well. Between Uchpanga and Humaspunco the roll-call of hot market metals (zinc, silver, lead and gold) is impressive. Pinta was discovered in ICG’s second and most recently reported mapping and sampling program. Approximately 800m east of Humaspunco, very early indications are that it is similar to Humaspunco. Just weeks old, the work at Pinta will be fast-tracked to catch up to that conducted at Humaspunco and Uchpanga. Pinta’s potential lies in the fact that the vein direction appears to connect Pinta WITH Humaspunco (some 800m to the west) and that it displays the same limestone sequence as Humaspunco (and at Humaspunco this sequence contains the manto mineralisation). During the last quarter the company announced the raising of A$234,000 (before costs) through a placement to its single largest shareholder and one of the world’s largest specialist resources funds, Resource Capital Fund VI L.P. ( RCF VI ). In doing so, RCF VI increased its percentage holding in Inca from 12% to circa 17%. In August 2016 ICG completed a A$2.9million capital raising in which RCF VI again participated, investing a further A$240,800. ICG is now well resourced to conduct its exploration activities at Riqueza. Resource Capital Funds is one of the world’s largest resource investment funds with over US$2.5B under management spread across eight different stock exchanges. RCF’s continued support and investment in ICG could be a sign of a long-term partnership all the way through to production and beyond. Needless to say, the investment into ICG is a nice validator given RCF’s reputation and keen eye for successful resource projects globally. As with any stock we cover here at The Next Small Cap , one of the first ports of call is a lookout for upcoming catalysts. In ICG’s case, it is now well funded, has completed all the required environmental base-line studies and has recently submitted its application for a drilling permit at Riqueza. 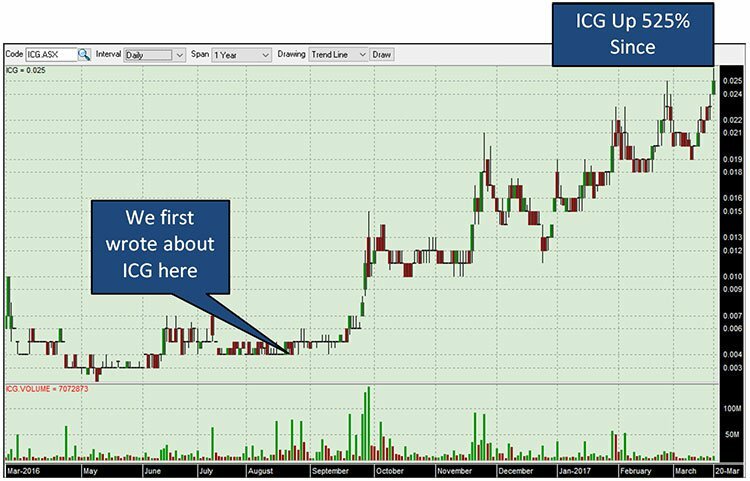 Once granted ICG will launch into a productive phase of drilling. Importantly, while waiting for the permit granting, there will be interim catalysts as well. Management have stated that the company intends adding significantly to the list of drill targets. ICG already has over 30 quality high-grade targets but, with the majority of the project area yet to be mapped or sampled, they will continue mapping and sampling with results to be reported as and when they become available. We like the company’s aggressive approach to exploration, the anticipated news flow, the possible scale of the project and we like the re-rate potential. Ultimately, a maiden JORC Resource is in the offing. That means production and/or JV/takeover. But before we get too ahead of ourselves, there is still a lot of work for ICG to do before it reaches that point – please do your own research before choosing to invest. One aspect that caught our attention during our research into ICG was the fact that its management seem to have a deft hand at making discoveries, advancing metals projects and creating shareholder wealth. 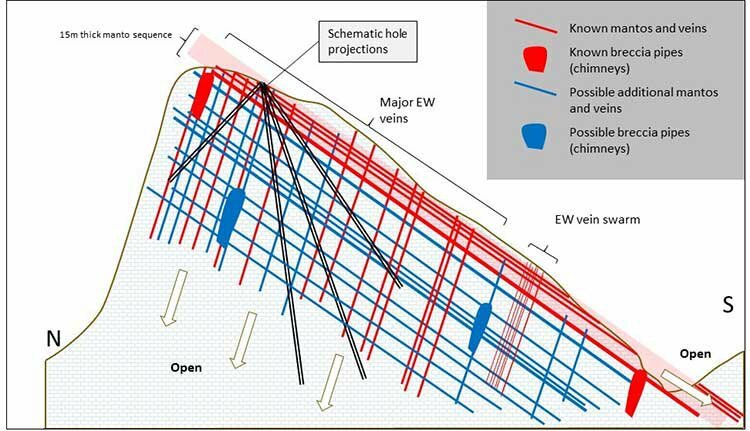 ICG’s management team have a tried and tested strategy of conducting astute exploration in order to generate the best possible drill targets and drilling outcomes. 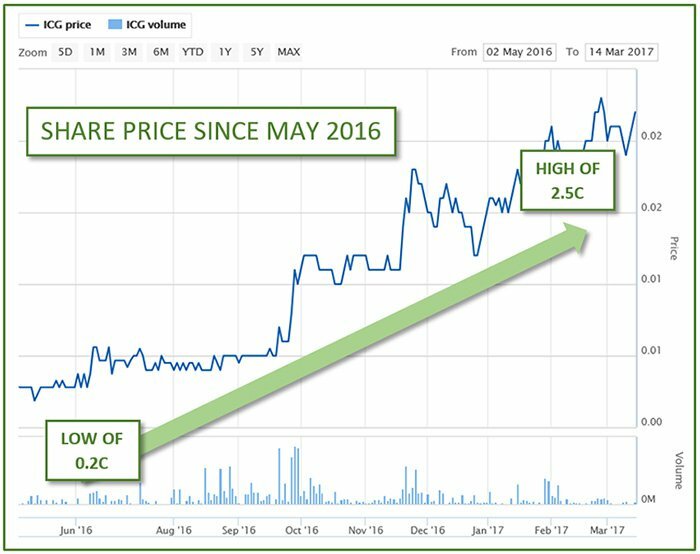 This strategy helped to raise the valuation of ICG from 1.7c to 17c — a gain of 900% — after making a significant discovery in its very first drill hole on a previously held project. This indicates that their strategy of careful exploration pre-drilling pays off. A “ten-bagger” is a pay day in any book. ICG’s team is planning to repeat the performance at Riqueza for the benefit of ICG shareholders. The fact that its share price is currently sitting at $0.004 makes ICG a speculative but low-priced entry into metals mining, just as this mammoth market begins to exit hibernation. The recent break-out in its SP from 0.4c to 0.7c just prior to the capital raising and on the back of some early high-grade results at Riqueza indicates one could do worse than backing this early stage metals explorer given its proven expertise and history. Of course we should remind readers that success is no guarantee here – this is a speculative stock, and always consider your own personal circumstances before choosing to invest. The current consensus amongst metals analysts is that base metals such as zinc, nickel and copper are undergoing steady price recoveries backed by renewed Chinese demand, dovish monetary policies across the globe, and possibly most importantly, supply cuts brought on by a wave of bankruptcies in resources over the past five years. ICG’s prime focus is on zinc, silver and lead (with more than a passing interest in gold) due to the superlative sampling results it has seen so far at Riqueza. Zinc prices, for example, are currently at their highest level in over a year, netting around US$2,275 per tonne. Silver, lead and gold too are all at the highest levels in over a year. ICG’s progress in Peru may just have come at the right time considering the broader market dynamics. 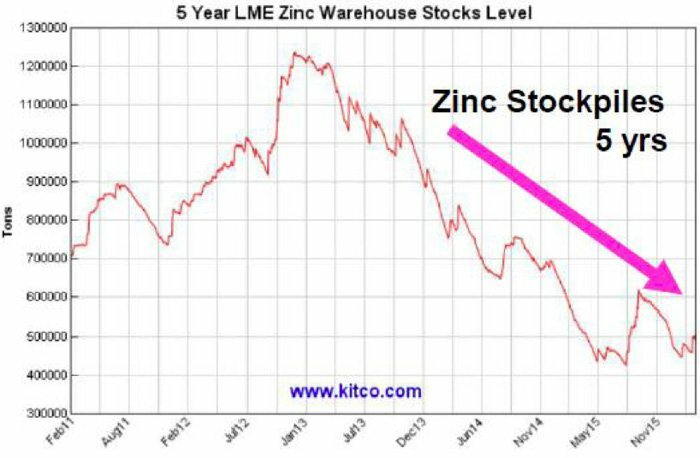 On the supply-side, take a look at the prevailing downward trend in zinc stockpiles. This is what analysts are referring to when they’re talking about “supply imbalances evening out”. 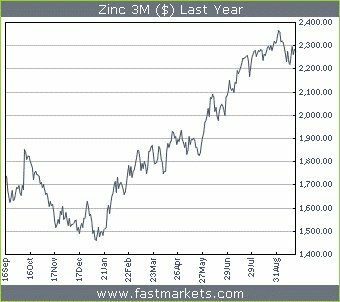 Zinc has been in a glut until 2013, and now in 2016, it has stabilised with a potential up-move coming as metals demand slowly rises. 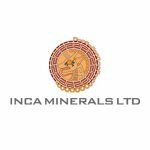 Peru is famous for its Inca history and just like the name, Inca Minerals, there is now an entirely new Inca empire being assembled in Peru. In terms of production, Peru produces around 1.37Mt or 10% of the world’s entire zinc supply each year. Peru is also the world’s 2 nd largest silver producer, generating 121.5Moz in 2014. 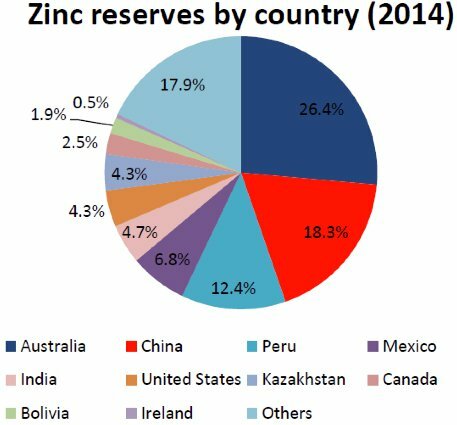 From a mining reserve perspective, Peru ranks 3 rd in the amount of total zinc reserves found within its borders, currently estimated at 25 million tonnes or 12.4% of total global reserves. Peru is therefore one of the most opportunistic mining regions in the world — there is relatively more spare capacity there per dollar spent than any other region, because areas such as Australia and Mexico are considered far more expensive and require relatively more effort to progress given the stricter regulatory frameworks. The Return of the Inca Empire? The famous Inca Empire depicted in hundreds of films and popular culture came to an end in the mid-1500s. At its zenith, the Inca Empire grew its empire through peaceful assimilation and showing other cultures a better way of doing things when it comes to building communities and ‘society’. Now in 2016, an Australian explorer by the name of Inca Minerals Limited, having just raised $2.9M, wants to repeat history by building a rather different type of empire in Peru. ICG has bagged a high-grade project in the heart of Peru that has very high optionality and flexibility. There are several metals that could potentially contribute to ICG’s cash flow over the coming years. The good news is that these metals occur at bonanza grades in veins, mantos and breccias that stick out of the ground – you can literally trip over them. Further exploration will determine whether they continue below ground as well. 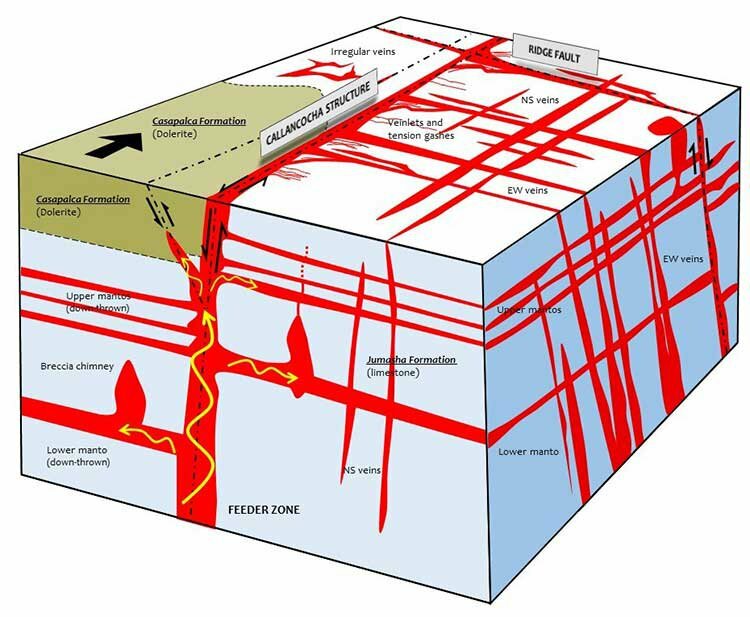 While waiting for the drilling permit, ICG will continue to focus on discovering further zones of high-grade mineralisation so we can expect steady news flow on this front. ICG has operated in Peru for more than 5 years – it’s an experienced operator in one of the best destinations in the world for resource discoveries. 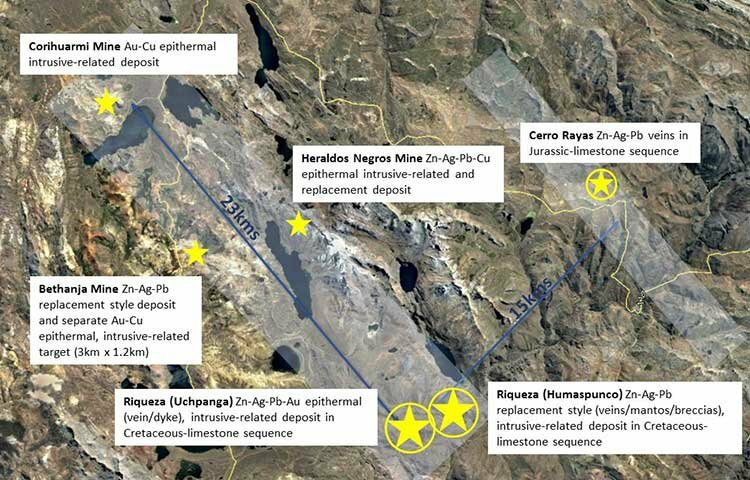 ICG’s flagship project in Peru is Riqueza – a zinc-silver-lead project with gold and copper. Pre ICG’s involvement, Riqueza was known to host 7 mineralised bodies – the count is now 30 mineralised bodies and ICG has mapped and sampled less than 20% of the project area. Peak grades from sampling include – 22.70% Zn, 920 g/t Ag, 24.15% Pb & 3.59 g/t Au. Continued mapping and sampling to come – ICG is in “discovery” phase. More positive news flow anticipated as catalysts in the near term and the share price has shown a strong response to this type of news. Riqueza has never been drilled – environmental baseline studies complete and application for drill permit lodged. 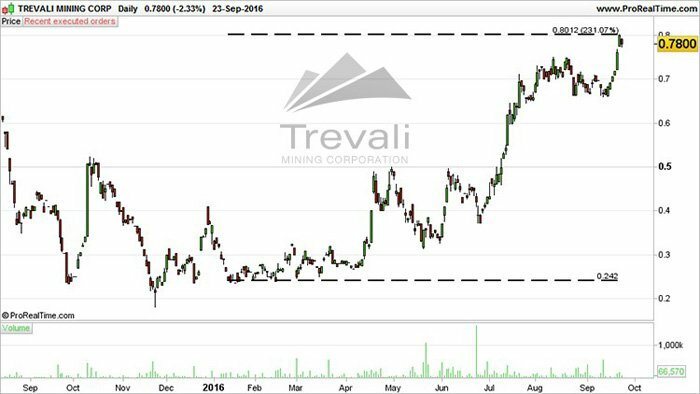 Drilling should provide further share price catalysts. Global prices for zinc, silver and lead are at the highest point in over 12 months. ICG is speculative – but have the support and continued investment from RCF, a globally recognised investment fund, reputed to have a keen eye for successful resource projects globally. We are looking forward to the expansion of this Incan empire.